A registered nurse will teach you about your disease process, diet and medications, assess your medical condition, or provide medical treatments including infusion therapy. Visits usually last 30 minutes to one hour. This service requires a physician’s order. It may be paid for by Medicare or other insurance or private pay. HealthWatch takes care of the related paperwork. Free to qualified Medicare beneficiary. Other rates depend on payor. HealthWatch home health aides meet standards that exceed any state or federal requirement. 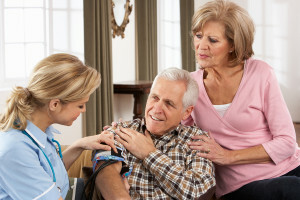 A home health aide can assist the client/family with activities of daily living including bathing, oral hygiene, toileting, transfer, exercises, etc. Visits may last 30 minutes to two hours and are under the direction and supervision of a registered nurse or therapist. Visits of 30 minutes to one hour by a registered therapist will allow the time to prescribe exercises, gait training, and teach a home exercise program. This program will be individually designed to help over-come physical challenges. A registered speech therapist will evaluate, treat, and establish a program for persons with speech or swallowing disorders. Visits are 30 minutes to one hour. The major treatment categories for our registered occupational therapists include: stroke, mental health, developmental disabilities, cerebral palsy, and head and hand injuries. The occupational therapist uses goal-directed activity in the evaluation or treatment of persons whose ability to function is impaired by normal aging, illness, and injury or developmental disability.